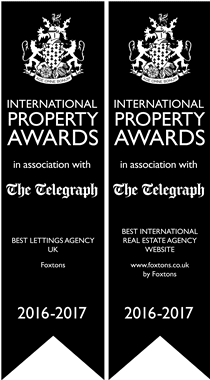 International Property Awards is a prestigious awards ceremony aimed at recognising the finest in property across Europe, Africa, Arabia, the USA, Canada, Caribbean, Central and South America, and Asia Pacific regions. Up to two top-scoring 5-star winners from each of the 48 different categories represented the United Kingdom in this year's ceremony for the prominent title of "UK's Best", to then compete against other regions for the ultimate "World's Best" title. The winners were announced at a glittering awards presentation ceremony in London on December 12th 2016. A panel of expert judges from all over the world scored Foxtons on each category which matched their areas of expertise. "This has been a fantastic year for Foxtons as we continue to lead the way in the property industry with our innovative digital solutions and our quest to make property search as easy as possible for our customers. With the launch of our new virtual reality platform and the enhanced My Foxtons portal, which allows our sellers and landlords to manage the entire sales and lettings processes at the touch of a button, we raised the bar for the level of transparency and customer service experience within the industry."